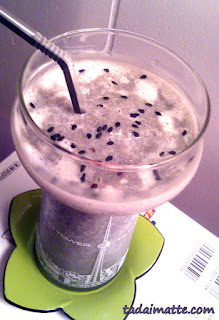 Lately I've been craving those black sesame iced lattes from Dotour - so much so that I've even pledged to pick up some kurogoma marshmallows the next time I visit Chinatown or the Pacific Mall. (In case it wasn't obvious, I'm crazy about black sesame!) Well, I've tried the latte version a few times lately and I find that I drink it very quickly, so I decided it was time to try a smoothie recipe instead! Did you know that black sesame is very nutritious, and supposedly can help you grow strong, glossy hair? It's also delicious - that's good enough for me! I use store-bought nerigoma, or you can make your own! Mix the nerigoma with a little hot water to help it dissolve, then add it to the blender with the milk and banana. Add the ice cubes and then the honey last - adding the honey first will cause it to stick to the sides of blenders like mine (I actually use a mason jar blender), so it's better if you pour it over the ice and the banana to prevent that. Blend on high and serve! Garnish with whip cream, black sesame seeds or kurogoma marshmallows, if you're feeling fancy! Omit the banana and add the ice cubes to the glass instead of blending them for a more latte-like experience. For Toronto buyers, you can pick up Japanese nerigoma at J-Town or Sanko, and T&T sells a Korean-made black sesame paste made with brown sugar that I recommend. If all else fails, go the mortar-and-pestle route. Enjoy!